In Buffalo, NY, the Albright Knox Art Gallery and Delaware Park are some of the most popular locations for wedding photos. We encountered six different wedding parties at once there. But, if that is where your bride and groom want to go, we can only warn them in advance that it could be busy and may have to wait your turn. Elisa and David had a beautiful July wedding in 2015! This couple was amazing and so great to work with! After working with the bridal party first, we sent them back to the limo to party. We like to have the couple alone to get some amazing shots. Sometimes if there is a crowd watching, they can yell out things or make comments that take away those intimate moments we want to capture. The wedding party never complains either. That means they can go and drink on the limo! Elisa and David look amazing in this photo! 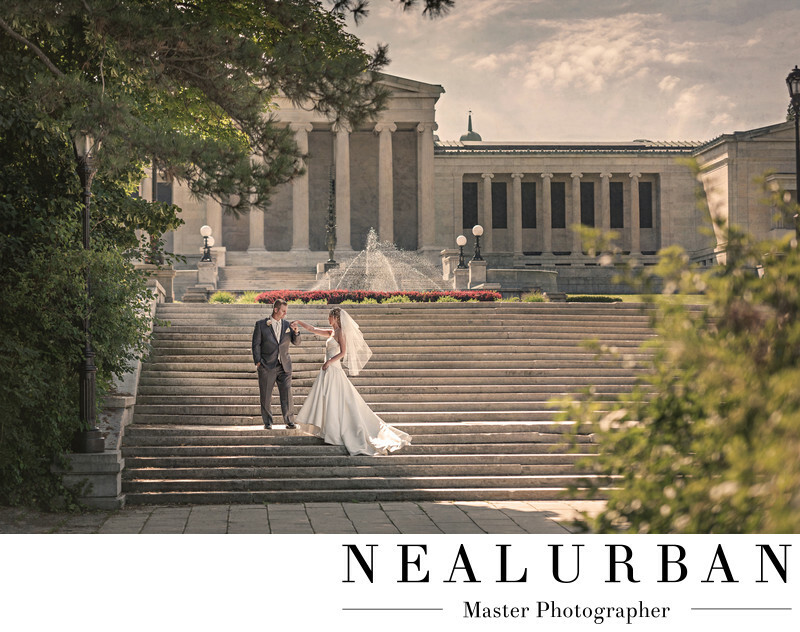 The Art Gallery is a beautiful location, you can see why so many couples want to go there for wedding photos. There is such great balance in this image. The couple is on the rule of thirds (a photography term). There is greenery to the left of the couple, to the right foreground, then little hints in the back ground. The left and right side greenery almost frame the couple in. It also looks like we were peeking in on them to grab the photo. We had David take Elisa's hand as she slowly walked up to him. David is holding his lovely wife's hand so gently and almost going in to kiss it. He is still keeping his cool with his hand in his pocket. The back light on Elisa's veil is gorgeous too! There is just enough light to make this image seem like a fairy tale!